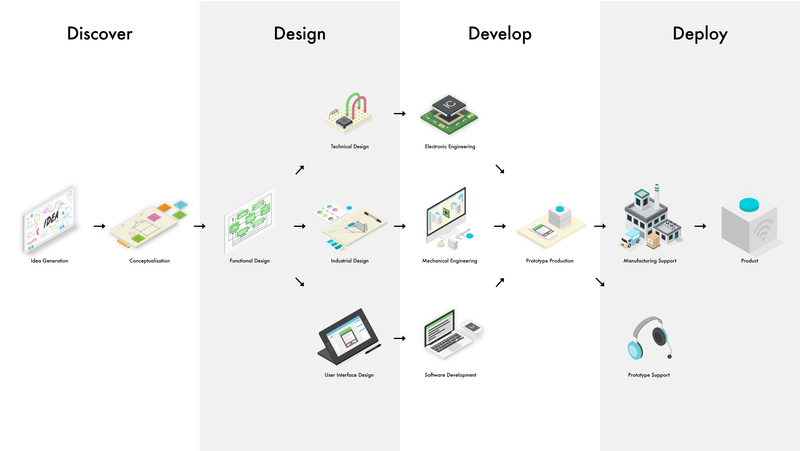 With interactive product design we mean connecting physical objects with digital media by combining materials, electronics and software. This could result in an app-enhanced toy or an internet controlled lamp. An interactive product can be a lot of things but our approach is often the same. We innovate on your need using idea generation and conceptualisation. Concepts mature by using different design and engineering skills resulting in a prototype. After all development is done we can provide support on product manufacturing and finally market launch. To give you more insight into our approach, we have compiled an overview of all creative services we can provide to design interactive products for and with you. Sophisti is approached by clients with a need for innovation or in some cases Sophisti suggests an opportunity to you. This need for innovation may be very clearly defined but in some cases it requires a few conversations to get to the core of the project. As a result of these meetings Sophisti delivers a debriefing. This can be a one-pager or a visual slide-show with references. The main outcome is a validation that all parties are on the same page before Idea Generation starts. Sophisti starts an Idea Generation process using the project Debriefing as a starting point. By preparing and hosting one or more workshops a significant number of product ideas are generated. These workshops are attended by Sophisti team-members but you as a client can always join. In fact often end-users join in what is called Co-Creation. The ideas are ranked and validated using your criteria after which a selection is made. Sophisti will visualise the selected ideas through sketches making it easier to communicate the outcomes. Sophisti uses the previously selected ideas to develop several product experience concepts. Different aspects like user experience, enabling technologies and design come together here. This process requires explorative research such as user observation, desktop research concentrating on social trends and technologies, validation with stakeholders and early proof-of-principle testing. After Conceptualisation early sketches are made, leading to the Industrial Design in later stages. A pre-agreed number of concepts are visualised in use-scenarios. Rough price estimates can be made to evaluate viability. Sophisti places the concepts on a road-map based on the quality and viability of the propositions. At Sophisti a product is designed with optimal user experience as the main focus. This requires creating and exploring different use scenarios. In case of connected products, the user experience should cross between physical and digital interaction as seamless as possible. The Functional Design is defined using state-transition diagrams, sketched scenarios and includes a detailed list of functionalities and product specifications. Result is the main starting point for the Industrial Design, Component Selection and User Interface Design. Sophisti can also develop a ‘Wizard of Oz’ prototype to gain user insights. A Wizard of Oz prototype is a totally staged premature product experience which can be used to simulate an experience. This can also be recorded on video to communicate the envisioned user experience to stakeholders. At Sophisti form follows function so the Functional Design is the foundation for the Industrial Design. With functionality and human factors in mind Sophisti explores different shapes, materials and dimensions. Naturally your brand acts as an important source of inspiration. Endless sketching results in a preliminary Industrial Design visualised in illustrations and computer renderings. After this preliminary Industrial Design has been approved by you, Sophisti proceeds by perfecting the design using Computer Aided Design Software. These 3D models are prototyped with for examplea 3D printer in order to validate dimensions, shape and ergonomics. It has to feel comfortableas well as look good. The Industrial Design is finalised with a 3D model of all components and a detailed list with production processes, colours and materials specified. Sophisti explores the technologies to enable the Functional Design. Sensors and Actuators are studied using data-sheets and development boards, after which a selection of main components is made. With connected products, communication technologies like USB, Wi-Fi, Bluetooth Classic, Bluetooth Low Energy, NFC and low-bandwidth radio are evaluated and selected. Weighing factors include compatibility, cost, bandwidth and power consumption. The last step is selecting the main and peripheral controller ICs. At this point, Sophisti can estimate the power consumption of the product in active and stand-by mode and select a suitable power source.The result of this process is a list of all main electronic components with links to the datasheets, wholesale prices and estimated mass-procurement prices. Sophisti is very experienced in designing connected products where screen based interfaces such as a mobile app or public display enhance the physical product. The Functional Design acts as a guide for the User Interface design. Sophisti starts with the creation of wireframes, which show the information and controls that will be placed on each screen as well as the interaction flow. After this has been approved by the client, the next step is the graphic design of the interface. Both the clients brand and the target audience is a source of inspiration here. The result is a series of screenshots that will be presented for feedback and approval. Sophisti can develop a web-based ‘mock-up interface’ to make it easier to imagine the interaction flow in the end-result. Game Design follows roughly the same process but adds concept art which are detailed drawings of characters, environments and items. Sophisti has experience with creating original and applying externally licensed artwork. With the Industrial Design completed, there is still Mechanical Engineering that needs to take place before your product is ready for production. All parts are prepared for manufacture and assembly through 3D modelling, prototyping and testing. Parts are designed to be manufactured efficiently with little material waste. Sophisti has extensive experience with the following production techniques: injection moulding, die-casting, sheet metal works, vacuum moulding, CNC milling and laser cutting among others. All parts are tested for correct fitting and functionality, including electronic components (e.g. tactile switches, batteries, PCBs). The final parts are 3D modeled with 2D technical drawings attached. In case of decorating or cutting, 2D vector drawings are prepared. With a detailed list of parts and production technologies the product is ready for final prototyping and can be quoted for mass production. With the list of electronic components finalised, Sophisti starts the design of the electronic circuit of the product. The circuit is developed using EDA (Electronic Design Automation) software in which all components are laid out. Minor components like resistors and capacitors are selected at this stage. Mechanical Design restrictions are taken into account as well as manufacturing concerns. This includes component placement and programming/testing points. Throughout the design process several prototypes are made, starting from connecting evaluation boards up to the final integrated Printed Circuit Board. Sophisti can also develop the firmware to enable the intended functionality and interaction with your product. Once the electronics function correctly and are approved, the PCB and all needed components are quoted through 3rd party suppliers and distributors for mass-production. Together with the prices of mechanical components, this leads to a detailed cost estimation of the product. Sophisti believes that Software Development is an integral part of the creative process, wether it is firmware or a product-enhancing smartphone app. While still in the design phase, Software Development is often well under way. Sophisti develops applications for Smart Devices, Multi-touch Tables, Interactive Installations and is always on the look out for other platforms. For developing the frontend, Sophisti uses languages like Objective-C, Swift, C++ JAVA and Action Script 3. The frontend will often communicate with an existing backend or use external services such as Google Analytics. In some cases there are no services available. Sophisti then develops a backend for testing purposes which can be the foundation for a more scalable one in the future. Sophisti uses JIRA for progress management and GitHub to manage the code-base. After the first Beta of the software is ready, Sophisti distributes it to you and your customers to evaluate. For Smart Devices, Sophisti distributes the App using TestFlight or HockeyApp. For beta-testing Sophisti also builds test-robots. When the software is ready and approved for production, it is submitted to App-Stores or installed on the computers that will run it. When software runs on a dedicated computer (like with a Multi-Touch Table), remote access software such as LogMeIn is used to install, update and support the software. The Mechanical and Electronic Engineering enables the production of high quality integrated prototypes. Sophisti has a big network of part suppliers to build excellent prototypes. This includes suppliers of plastics, metal parts, electro/mechanical components, circuit boards, sheet-based parts, packaging and companies specialised in decorating parts. Once all parts procured, made and delivered, Sophisti assembles the prototypes for small series, or outsources assembly in case of bigger series (typically 100+). For Interactive Installations the process is similar but in most cases external companies handle the assembly and are able to offer warranty and service on the installation. Sophisti offers standard support on prototypes (3 months) and software (12 months) in which any technical failures caused by Sophisti will be fixed without cost. In some cases this period can be extended with a Service Agreement. This way you as a client can rest assured that your software is compatible with Operating System updates and that Interactive Installations are fixed as soon as possible. Sophisti can keep improving software under a Development Agreement on a monthly invoice basis. When a design moves into production Sophisti can be of assistance in multiple ways. First is supplying all the specifications and drawings, which allow Contracted Manufacturers and suppliers to come up with quotes. Sophisti can suggest CMs and suppliers in Western-Europe, Eastern-Europe and Asia. When a CM is selected, the next step is to optimise the product for manufacturing. This includes determining what tools need to be made and how to set-up the assembly line. In addition, testing procedures will be developed to prevent malfunctioning products. When the first samples come from the CM, both the client and Sophisti evaluate quality and asses if it functions as intended. If this isn’t as it should be, Sophisti will work with you and the CM to get the production smoothened out.